Join the Fun, Show Your Support! Each year Peace Arch Hospice Society supports hundreds of individuals and families on the Semiahmoo Peninsula who are facing advanced illness, grief and end of life. Your fundraising dollars will go towards providing physical and emotional care to the terminally ill and ongoing bereavement support after the death of a loved one. 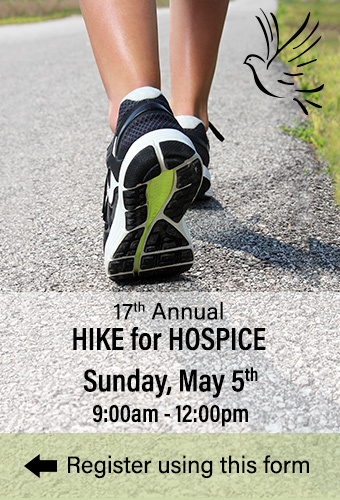 Held the first Sunday of every May, Hike for Hospice is our biggest fundraiser of the year in support of our important Hospice Society programs and services. This all-ages event is the perfect opportunity to bring family and friends together for a great cause. Register today! Set a pledge goal and start collecting pledges and monies. Ask your friends, family, and co-workers to assist you in reaching your goal. Hike as an individual or as a team and be eligible for category top pledge prizes. This year, each $20.00 registration includes a hat and a water bottle! Note: You will not receive a tax receipt for your registration fees. If you'd like to include a donation in addition to your registration fees, please indicate the amount below. A tax receipt will be sent to the address specified in Step 1 above. If you wish the tax receipt to be sent to a different address, please indicate below. If you have any special instructions or questions concerning the tax receipt please specify below. Please review the information you submitted and agree to the Terms of Service before continuing to process your credit card payment. Confidentiality and information security policy. Online donations, membership fee and other payments with Peace Arch Hospice Society are secure. Peace Arch Hospice Society with SSL encryption standards, under which transaction information will always be transmitted securely. Payment is made through PayPal. Peace Arch Hospice Society does not store credit card information for online transactions. As a result, users are required to submit credit card information with every transaction. If for any reason you require a refund of your registration fee, please contact the office of the Peace Arch Hospice Society at (604) 531-7484. Refunds will be processed within 15 days of payment. "I hereby release the organization of the event, their agents, volunteers, the event sponsors, and Peace Arch Hospice Society from any and all liability. I authorize the use of photos showing my participation in the event." Each Team Member must sign waiver on their own pledge form. Not registering, but want to make a pledge?